I told Rich that I would make him a coconut cake when we got back from NYC. I delivered on my promise by making him some coconut cupcakes. It has all the components of a layered coconut cake but in cupcake form. The cupcake batter has coconut milk, shredded coconut and coconut rum. The filling is a coconut pastry cream. The cream cheese frosting has some of the coconut pastry cream mixed in and then the whole thing is topped off with some toasted coconut. I don't know how much more coconut goodness I could've packed into this cupcake, but I did my best to really max out the coconut factor and I think I succeeded. So if you're looking for a cupcake that really screams coconut from head to toe, this one is for you. Preheat oven to 300 degrees F. Spread the coconut evenly onto a baking sheet and toast until lightly golden brown, stirring once, about 8 minutes. Turn off the oven and let the coconut sit in the oven until very dry and crunchy, about 10 minutes longer. Let coconut cool before using to decorate the frosted cupcakes. Preheat oven to 350F. Line 16-18 standard muffin cups with paper cupcake liners. In the bowl of stand mixer using the paddle attachment, cream butter and sugar together at medium speed until light and fluffy, about 3-4 minutes. About a tablespoon at a time, add the eggs. (If mixture appears curdled, stop adding the eggs, increase speed to high, and beat until mixture is smooth and shiny. Return to medium speed and continue adding the eggs.) Continue beating until mixture is ivory colored. the entire process of adding and beating the eggs should take 3-4 minutes. Reduce speed to low. In 3 additions, add the flour mixture alternating with 2 additions of the coconut milk. Add the rum and vanilla and beat until smooth. Remove bowl from mixer and fold in the shredded coconut. Spoon batter into the prepared muffin pan, filling each cup about two-thirds full. Bake at 350F until the tops spring back when lightly pressed and a cake tester comes out clean, about 20 minutes. Allow cupcakes to cool in pan for 10 minutes. Remove cupcakes from pan and cool completely on wire rack. Combine the whole milk, coconut milk and vanilla bean and scraped vanilla seeds in a medium nonreactive saucepan and bring to a simmer over low heat. Whisk together the yolks, sugar and cornstarch in a large bowl. Remove vanilla bean from warm milk. Slowly whisk the warm milk into the egg mixture then return the mixture to the pot over medium heat and bring to a boil, whisking constantly, until thickened. Scrape the mixture into a clean bowl and whisk in the rum and vanilla extract. In order to avoid a skin forming on the pastry cream, cover with plastic wrap pressed directly onto the surface of the pastry cream. Refrigerate until cold, at least 2 hours. In the bowl of an electric mixer fitted with a paddle attachment, combine the cream cheese, butter, coconut pastry cream, vanilla extract on low speed. Add 2 cups of the confectioners' sugar and mix until just smooth (don't whip). You may or may not need the remaining 1 cup confectioners' sugar depending on how stiff or sweet you want your frosting. With a paring knife inserted at an angle, gently cut out a cone shaped hole from the cupcake. Spoon about 2 teaspoons coconut pastry cream into the center of the cupcake. Slice off some of the bottom of the cone and replace the top of the cupcake. Alternatively, using a pastry bag, insert the tip into the top of your cupcake and pipe the pastry cream into the center. Frost your filled cupcakes with the cream cheese frosting. Make sure to cover the cut marks with the frostin. Sprinkle frosting with toasted coconut. Store cupcakes in the refrigerator. These sound like exactly what I have been looking for. Your recipes always turn out wonderful. I'm looking forward to making these. They look irresistible! I love the filling, mmmhhh! this looks delicious. Thnx for sharing! 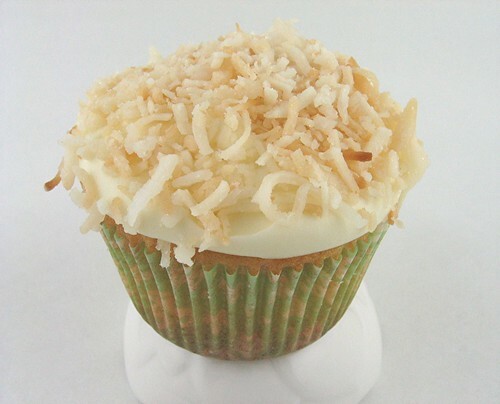 Thank you for providing a coconut cupcake recipe that uses coconut milk! 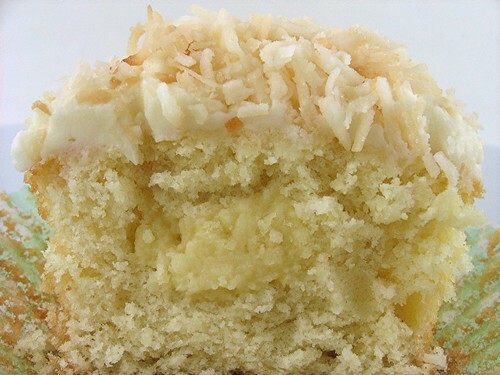 All the coconut cupcake or cake recipes I have seen (other than your cupcake and previous layer cake recipes) either use fresh coconuts (scary and time consuming) or simply add sweet shredded coconut to the top and mix it in the batter.I think coconut milk is such a great ingredient and adds great coconut flavor to savory and baked goods. Thanks for sharing your recipe. I love visiting your blog. Ive been looking for something like this for months now!Thank you so much for sharing this:)If you won't mind, I'd really love to guide foodista readers to your site. Just add your choice of Foodista widget at the end of this blog post and you're all set. Thanks! Wow, your recipes look delicious. Goody, another food blog! I can't wait to try some of these out. These sound amazing! I love coconut so I'll have to try them out definitely! 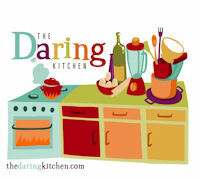 You have a great baking blog here and your bakers challenges are so accomplished!